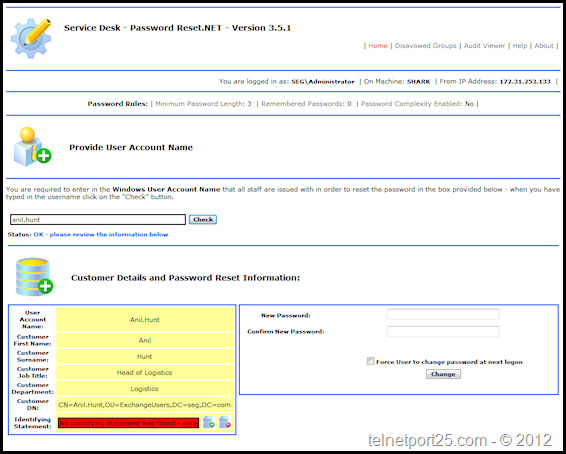 The telnetport25.com Service Desk.NET Password Reset tool is designed for small to medium sized organisations which have Service Desk operators whom it is not appropriate to provide access to the MMC of ADUC (Active Directory Users and Computers) – but require a secure means to reset customer passwords. Normally Service Desk Operators whom reset domain passwords at the front line have their rights delegated to them via the Active Directory administrators for the organisation. This method can be fiddly and indeed requires the Windows ADMIN PAK to be installed on each service desk operator’s machines or indeed another 3rd party tool which can be expensive. The telnetport25.com Service Desk.NET tool is simple to install, web based and allows for Service Desk Operative to reset customer’s passwords under their own basic set of security principles (there is no delegation required by the Active Directory Admin). The tool allows for Active Directory Administrators to configure restricted groups – whereby if the target account is a member of a group which is “Disavowed” the password cannot be reset and an event is logged in a secure database. Windows 2003 x32 Standard or Enterprise Edition (R2) – RTM Edition is fully supported, however SP2 is recommended.